While driving around in your vehicle, there are all kinds of terrible sounds you might hear. The crunch made when you back into something, hissing air from a deflating tire, blaring horns from other angry drivers. But, one of the worst sounds imaginable is the sound of police sirens coming toward you. What’d you do now? How much is this one going to cost you this time? Traffic violations can seem like annoying, but minor, inconveniences. But, they can easily turn into big problems with serious consequences if you’re not careful. If you find yourself in this boat, you may not know whether or not you need to get a lawyer involved. The truth is, simply paying the fine and moving on may not be in your best interest. The beauty of our justice system is that you are innocent until proven guilty. Just because an officer issued you a citation does not mean that you’re as guilty as they say you are. Out-of-State drivers ticketed in Northwest Ohio. Let’s say you live in Pennsylvania and were traveling through Toledo on business when you were wrongfully ticketed (in your opinion) for a violation. Appearing in court to plead your case might be very costly (fuel costs, missed time from work, possible lodging expenses, etc…) and inconvenient when you don’t live here. Having a Toledo attorney represent you in court might be one possible solution to your situation. Some traffic citations can be serious and the associated punishments can be devastating for some people. Unpaid red light camera tickets can eventually affect your credit score if ignored. This can impact your ability to get loans, rent apartments, get credit cards, and even work in some jobs. You could lose your driver’s license for and extended period of time, which could affect your ability to get to work. Some violations require possible jail time. 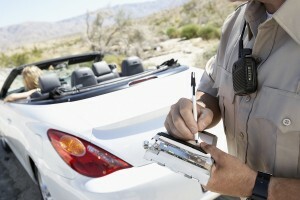 Often times, hefty fines in the range of thousands of dollars are associated with these citations. Traffic offenses can vary from minor infractions for speeding to serious crimes like vehicular homicide or aggravated assault with a vehicle, with many other offenses falling in-between. It’s important to know that someone is on your side, fighting to make sure all of your legal rights are protected throughout the process, and that justice really is served. From Day 1, I am committed to every case I accept, and right from the beginning, I always prepare to take each case to trial. You can have confidence knowing that I am dedicated to protecting your rights by gathering the crucial information in your case, witness testimonies, and available evidence, and telling your story so that the courts can see your account of the incident in question. Remember, it’s their job to prove your guilt. The law says that you’re innocent otherwise. If you have questions concerning your legal rights after a serious traffic offense, please don’t hesitate to contact me. I can about protecting all of your legal rights, and making sure you get the fair and just trial you deserve.